I dont want to thread jack the existing thread. this is also a cross post from main forum, I should have posted this here from the get go. What type of tackle is appropriate for this venture? I was thinking med action spinning gear with 10-15lb line? would my 9' surf rod be appropriate for horsing in big salmon? what has been your go to tackle? awesome! but what is a mud shark? ya as i know now the main salmon run is tapering off, there are salmon trickling up, the more silvery ones would be the ones to keep to smoke (2 per day non res 7 day is 35 bux 1 year from dop is 70$) u dont want to keep the black ones with spots as they are about to die in a few, but they fight real good. being that u are in danbury stop at the valley angler or newtown b&t as they have a varity of products to help u. i dont know if ur looking for a new rig but if u are a less expensive rig would be a tfo 9'10wt lefty krey series flyrod and a medium arbor reel. and as for a spinnin rig 9-10' minimum 2500-4500 size reel#12-15 p-line on one spool and #8-10 p-line on the other spool heavier line for salmon and lighter for steelies. personally for spinning i prefer stradics but they can be pricey. rods i like the st croix wild river series, i have a 9' lite power mod action cant move a #20 salmon very well in the current. i recommend a 9-10' in a med-med hvy power mod action as u dont want anything to stiff as they rod acts like a shock absorber and helps tire out the fish when they run. i also tried #40 braid just goofin and i hooked into a few mud sharks and couldnt move em and i ended up locking the drag and they would still rip it off like it wasnt on and just broke the leader. also keep an eye on fraying on the leader after a while it starts to look chalky. as i last checked its runnin 960 cfs id say 2 #2 split shots will get u down in a med fast run, but make adjustments based on current and if u keep gettin hung up. looks like i may make another trip up there this weekend, gona leave sat night and stay till monday/tuesday. keep me posted round friday/ saturday and mabe we will hook up somewhere up there, im gona mainly float fish but who knows. what rigs do you use to target steelies? if you really did hook into and couldnt budge em. i think ill throw in a 9+ surf rod for good measure. give the 'ole baitrunner some freshwater time. could be fun, doesn't take up a lot of room. You won't have any trouble budging a steelie. It's more of a stopping issue. When you hook up, be be prepared to giddy up! Bottom bouncing with beads is very effective. Most people use way too much weight when they are bottom bouncing, lighten up and you may be surprised. This goes for sacks and flies too. Two quick comments. You may want to shorten up the distance between your bead and the hook. Also, keep your split shot above your swivel. foul hooked one salmon. that was a RIDE. We went 200m down the river doing the dance until he jumped and I saw he was hooked in the fin (disappointing). I put too much tension on the line and he broke me off like a bad date. this guy on the other hand, was not so lucky. this was easily a 400m dance down the river. this was FUN! caught him on chartruese eggs on a #6 octopus hook, bouncing on the bottom. also, damn lake effect, it was snowing for most of today and it was COLD! 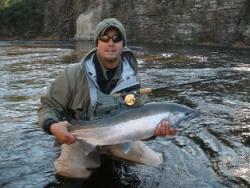 I will be back for the steelhead run and I will gladly brave the crowds to fight salmon come next run. we stayed at a place called browns campground. We fished a non-descript river that flows into a large unnamed great body of water.